The brilliant sun shone down on the two friends, writer and scientist, who hiked this morning; up and down hills and slopes, through the brambles and brush, sharing all the while. No idle chatter, but heavy, important matters of the heart were discussed. Family, honor, children, doubts and fears, and wonderings about the future with its possible regrets. For more than twenty years the two have shared tales of their journey and gained insight from each other’s viewpoints. Their friendship was made more brilliant by the sun warmed scenery so as to make it very clear to the writer, that she forever values the scientist and sees language in her studies of gene expression. Biology and poetry proved to be the perfect complement to the journey. 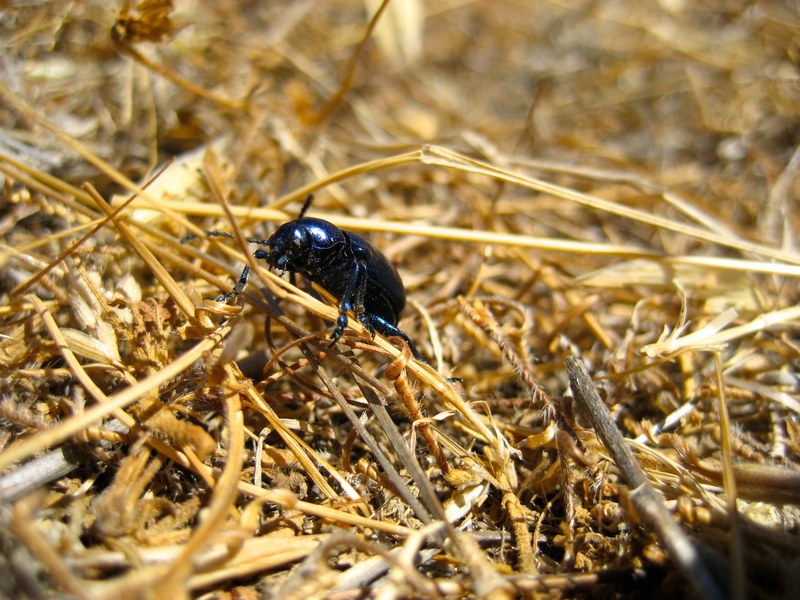 This beetle was out in the sun struggling to stay atop wind whipped weed grasses while proclaiming in brilliant hues of blue and black that “Life is a marvel!” He delighted the hikers and elicited giggles of wonder. This simple creature traveled among the weeds to add highlights to the morning’s jewel of a friendship well tended. I wonder how far that little guy travelled in a single day? I like that thought. It’s good to wonder! Great photo and story. i think this beetle is some sort of June Bug. Look into it deeper if you want. Hi Palguy! If it is a June bug, that will definitely change my opinion of them. Thanks for the tip. I shall look into it!